Burning Moon's Inside advice: Sun Tails Review! Every year during the holidays I look for fun and unique gift ideas for my loved ones, this year I was present with an opportunity to work with a company called Sun Tails on a review as part of my holiday guide. 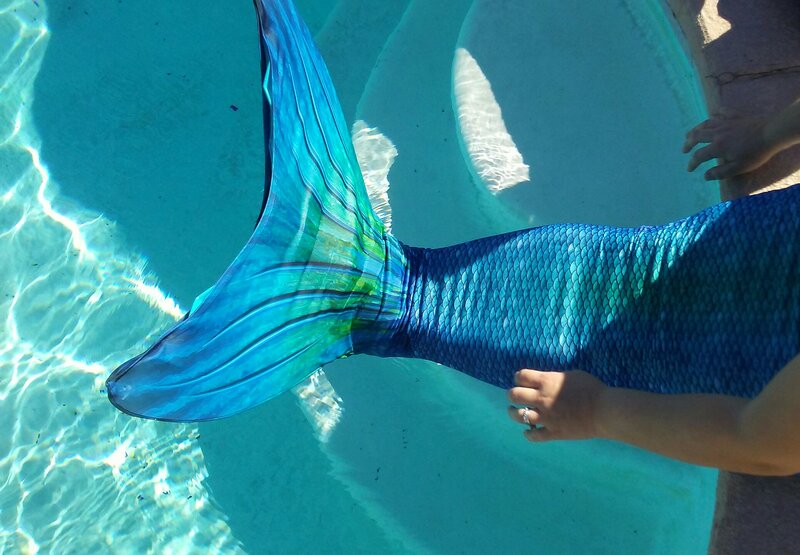 Sun Tails makes and sells mermaid fins and tails to transform you into a mermaid while you swim, they also sell shark tails. I was looking over everything and decided I would pick out a tail for me and test it out to see how it is before picking one up for the kids. The tail comes with a kit that is what they call training wheels for your tail, it comes with two puffy protective sleeps and plastic sleeves that go over the tips of the tail to help protect the monofin and the bathing suit material from becoming rip, torn and ruined. Until you are used to your tail, how it works and what surfaces are not good for it you must keep the padding on the tips of the tail otherwise it will void the warranty it comes with. The tail is easy to get on and fits well, it is designed to hold your legs together to make it easier to use the monofin, and it has a slit in the bottom where you can pull it over the monofin to complete the look of having a tail. I found I needed a slight bit of help getting the monofin on and pulling the bathing suit part over it but I could manage it on my own. 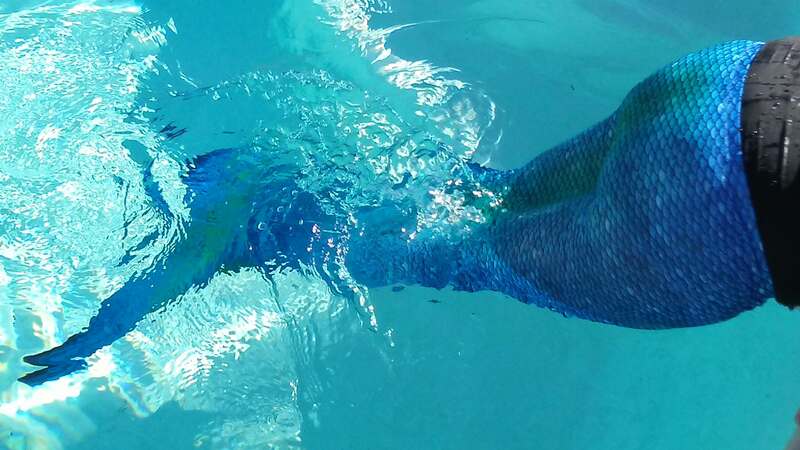 I wanted to fully test out the tail, but it is starting to get colder out even in Arizona and the pool water was freezing so I was only in long enough to snap a few photos and get out. I dig hang onto the edge of the pool and test out the fin a bit and I can tell it will be a helpful work out during the summer once I get used to the tail.Once it gets wet the materials will suction to your legs like a regular bathing suit but once you get out it will not hold onto the water. The mono fin is a lot of fun trying to use and really does give you a unique swimming experience. 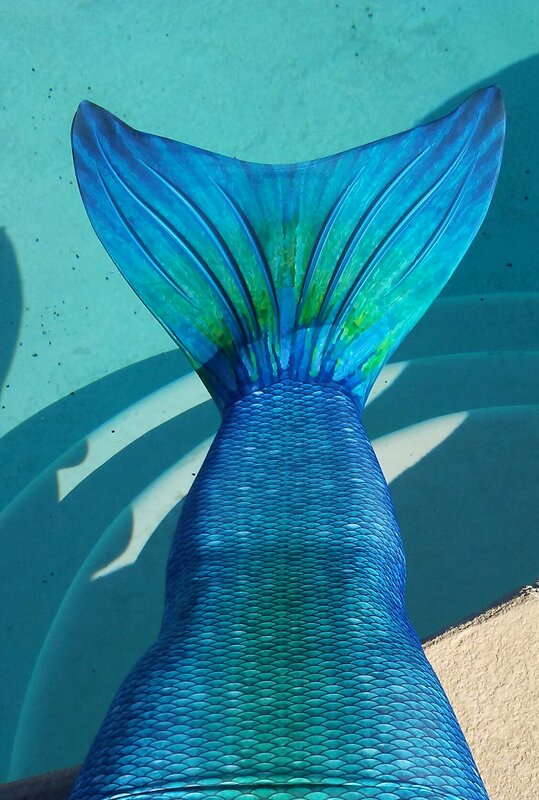 This Blue Lagoon Mermaid Tail + Monofin set is so nice! Wow, I always assumed it stayed really hot in Arizona. Vinyls With Character Giveaway & Review!